I recently started using Parse.com’ crash reporting and wanted to pay better attention to my build numbers in Xcode. I found this post on stackoverflow about it and used the solution. It works great and I certainly want to give credit where it’s due. 4. 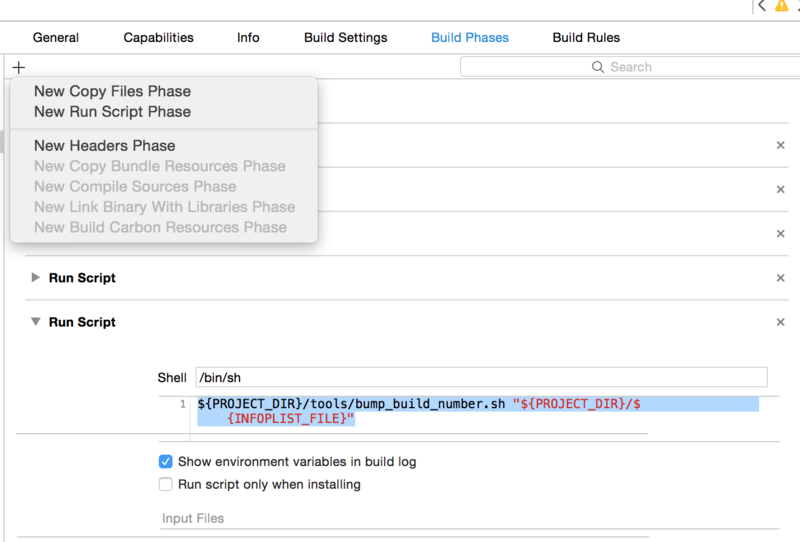 In your Xcode target, go to ‘Build Phases’ and add a new ‘run script’ phase (see image). 6. Change a file (so that the change flag is tripped in the script) and build. Verify the build number is updated. You can view the build output in the Report Navigator (View>Navigators>Show Report Navigator). This entry was posted in How to make an App, iOS/iPhone/iPad and tagged auto-increment, build number, xcode6. Bookmark the permalink.